Try IdealShape risk free today! It is amazing to me how just a few drops of essential oils can help you feel calm and relaxed or uplift you, depending on the kind of oils you use. I recently purchased the GuruNanda 100% Essential Oils with Diffuser kit from WalMart and so far - I love it! 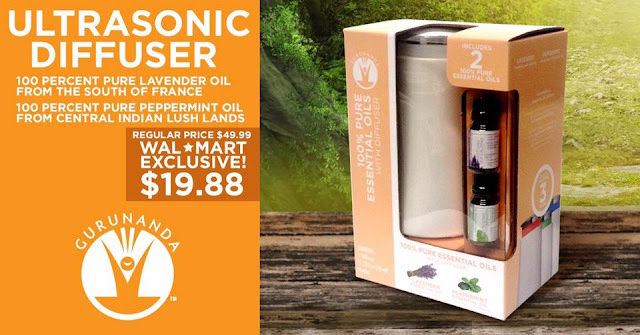 This kit includes 2 bottles of essential oils, Lavender and Peppermint, and an ultrasonic diffuser that disperses them into the air, where they release their wonderful natural fragrance and the healing aromatherapy benefits. It can transform a room into a mini DIY spa in seconds. The diffuser also features a color-changing LED light to add to the atmosphere! Lavender essential oil is a very calming scent. It is extracted from the flowers of the Lavender plant. The Latin name of lavender is Lavare, which means “to wash” due to its clean fragrance. Adding a few drops of the oil to the diffuser, especially at night, helps to relax and de-stress. I have also read that lavender helps with agitation related to dementia AND also helps repel mosquitoes! This diffuser would be nice to use while sitting on the porch or outside to help keep mosquitoes from pestering you. I love to use this at night while getting everyone ready for bed. I am a night owl so it helps me to get ready for bed a little sooner than normal. Peppermint essential oil is a very uplifting and refreshing scent. The oil is extracted from the whole plant above ground just before the flowering by steam distillation from the fresh plant. It is more intense and concentrated than most other essential oils so it does not take much at all! We love adding a few drops in our diffuser while doing work and homeschool. Peppermint helps with concentration, boosts your mood, and helps to reduce fatigue.